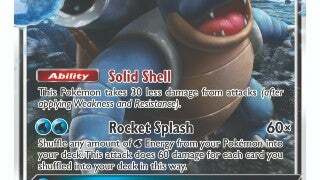 ComicBook.com has an exclusive look at some of the new cards debuting in the upcoming 'Unbroken Bonds' expansion of the Pokemon Trading Card Game. The next expansion for the popular card game comes out on May 3rd and will feature over 210 cards, including seven new pairings of Pokemon on a single card. These new TAG TEAM cards include Reshiram & Charizard-GX, Marshadow & Machamp-GX, Gardevoir & Sylveon-GX, Greninja & Zoroark-GX, Muk & Alolan Muk-GX, Lucario & Melmetal-GX, and the Ultra Beasts Pheromosa & Buzzwole-GX. In addition, there will be seven addition Pokemon-GX cards, over 25 trainer cards, and a new special energy card. ComicBook.com can exclusively reveal seven cards from the new expansion, which can be viewed in the gallery below. The new cards include the powerful Blastoise-GX, Whimsicott-GX, a new Zeraora card, and several Trainer cards. Blastoise-GX and Whimsicott-GX are both defensively-minded cards that can linger on the battlefield far longer than expected. Blastoise-GX's Solid Shell ability automatically reduces any damage its takes by 30, while Whimsicott-GX's Fluffy Cotton ability gives it a 50% chance to prevent all damage from an attack. Although neither GX are exceptionally overpowered, they both give trainers a few possibilities when paired up with other cards. The new trainer cards include a new Dusk Stone, which allows players to pull out certain Pokemon from their deck, a Martial Arts Dojo Stadium card that gives Pokemon with Fighting energy additional attack damage, and a Welder Supporter card that allows a player to quickly put Fire Energy onto a Pokemon and then replenish their hand. There's also the Triple Acceleration Energy card, which gives Evolution Pokemon a temporary boost in energy for one turn. Fans will have the opportunity to try out cards from 'Unbroken Bonds' in Prerelease tournaments that take place between April 20th and April 28th. To find the nearest participating retailer, visit pokemon.com/locator.